This lamp, manufactured by Moffatt in the USA for industrial applications, this lamp is made of top quality materials featuring a 24" heavy duty vinyl covered flexible arm that will not sag or move during use. A conical reflector puts maximum light where you need it. The outside of the lamp stays cool because of the revolutionary aluminum heat sink built into the top of the lamp housing. Even when using the maximum 100 watt light bulb! The lamp shade rotates 270° making sure it can always be in the right position for the best light possible. The toggle switch is mounted on the top for easy access. The base has a quick change coupling that allows 360° of rotation and can be quickly and easily attached to the mounting coupling hardware that comes with the lamp. 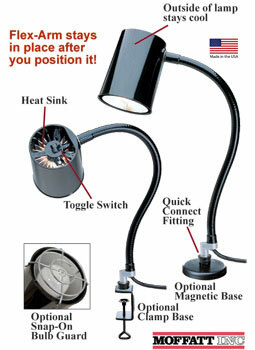 Mounting hardware for horizontal or vertical surfaces is included with each lamp. A magnetic base and a clamp base are available as options. These increase the mounting options for the lamp. An optional snap-on bulb guard is also available to reduce the risk of broken bulbs.